Agios Ioannis is a small village near the sea 73km away from the capital of Crete, Heraklio, and south of Kapetaniana. The climbing area has a lot to offer from 4a up to 6c+. You will need an off-road vehicle to get there as there is around 12km of really bad road. The bad thing is that you will need an off road vehicle to reach Agios Ioannis village due to bad road. Don't try to use your non off road car unless you don't care about it. You will need to travel until Kapetaniana first and then to follow the signs for Agios Ioannis (pay attention as its difficult to see them). A map showing you how to get there can be seen below. As you driving to Agios Ioannis around 200-300 meters before reaching the village you will see something like a parking near a chapel. Park there and you'll see the path on your left as you seen the sea. From there you will need around 30 minutes to reach the first sector. Avoid going there from May to early October, is simply impossible to climb more than 2 pitches due to been really really warm. You will enjoy climbing during the winter as even when the temperature is around 8 oC in Heraklion for example, here wont be lower than 13-15 oC. However, if you are crazy enough and you still want to go there during the summer take a LOT of water with you . All routes here are between 4b and 6c, plenty of easy routes with good protection and an easy way to abseil down. 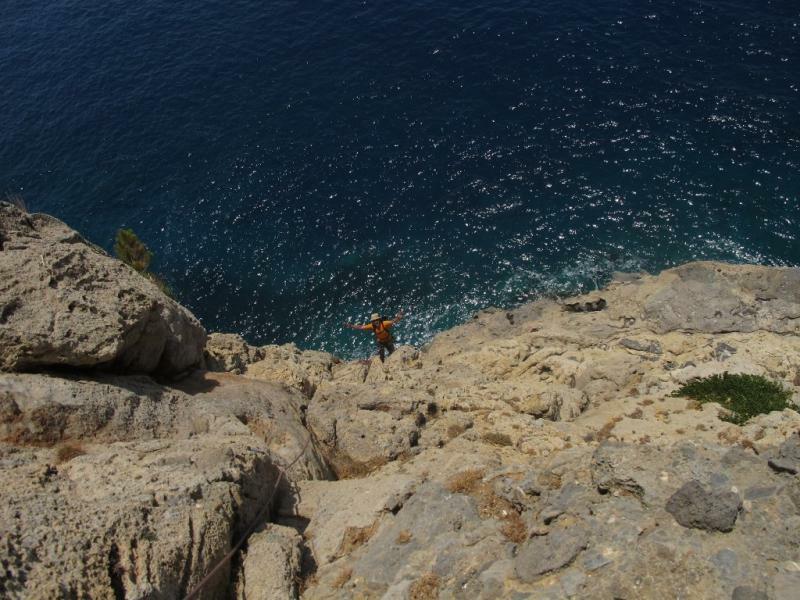 Here you will find routes from 17 meters up to almost 80 meters. All you need is your harness, your shoes, a helmet and a lot of quickdraws. Agios Ioannis and a few meters on the east more and more superb beaches. It is not an organized place but still you wilI find some people from the village. There are a few taverns, a mini market and some rooms in the area. 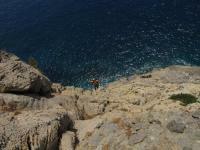 You can camp mainly in Agios Ioannis and not near the climbing area due to been full of sharp rocks. However, if you want to camp the best spot is inside the Agios Antonios cave.